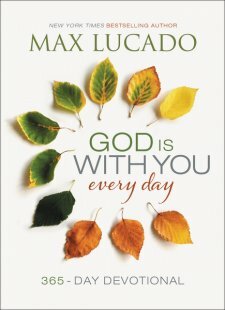 Welcome to my review for God is with you every day by Max Lucado a 365 day devotional. This is his newest book and its so nice its hardbound and has an attached bookmark in it which I love . Naturally I have not finished it yet its something you read at the start of the year and you read one a day. From what I have read I have fallen in love with this devotional its easy to do each day no matter how busy you are in the morning and it just takes a few minutes of time for each days reading. This book would make for a really lovely gift and I was so happy I got a chance to review it. It has a lovely cover , is very finely bound to last a lifetime and the right size for a devotional. As you can see from the cover photo its just so pretty and if I would have received it for a gift I would be very happy with the person who gave it to me.